In the Arctic, the risk of severe storms and floating ice pose challenges to keeping operations safe. With the right tools and support, telecommunications companies are forging ahead—braving one of the world’s harshest climates to lay transoceanic fiber-optic cable. These cable operations require extensive expertise and highly accurate, up-to-date information to prevent downtime, health risks and environmental hazards. Companies like Viking Ice Consultancy work with operators in the Arctic to ensure operations of a deep-sea cable project remain safe and efficient throughout. 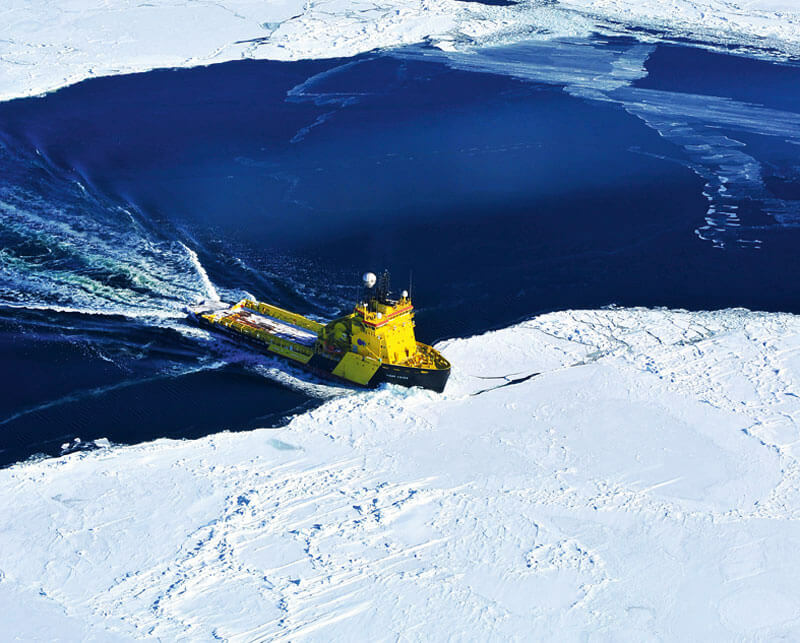 Viking Ice, a turnkey ice management and logistical solutions provider, has deep experience in ice-breaking and offshore operations in Arctic regions. With carefully laid plans, experienced ship operators, air surveillance, seamless communications and a comprehensive information and messaging system, they ensure the safety and efficiency of Arctic projects, such as maritime cable installation. One partnership that Viking Ice relies on to do that is with StormGeo, which provides tailored weather insight at the frequency and accuracy required. Viking first supplies StormGeo with the specific parameters for a current or upcoming operation, allowing StormGeo to visualize the forecast and identify the suitable weather windows for when, where and for how long weather conditions will allow for safe operations. Viking Ice has access to this insight in the dedicated web portal that comes with utilizing Offshore Weather Forecasting. If needed, StormGeo can support operations with a dedicated meteorologist onsite that provides immediate decision support on operative windows. This reduces the alpha factor for the operation and saves valuable time and money. Both Kjøl and StormGeo experts know that careful, informed navigation is vital, as ice can damage vessels, assets and cause harm to crew. Identifying problem areas and what the conditions will be when ships arrive is a crucial aspect of the information provided by StormGeo. This kind of analysis goes beyond a simple weather forecast by communicating the consequences of that weather. Navigating through the Arctic can often mean facing violent wind, vicious cold and towering waves that isolate vessels. In such remote and challenging climates, it is critical that Viking Ice maintains a bird’s-eye view of its entire fleet by monitoring the safety and effectiveness of each ship. Through StormGeo’s AIS service, Viking Ice receives an overview of its fleet, including each vessel’s position, speed, wind and wave data. “StormGeo is a commercial actor with excellent competency in weather forecasting; they have operational experience in many regions,” said Kjøl. “I would definitely recommend StormGeo to another company considering their services. Viking Ice’s extensive experience and partnership with StormGeo has enabled the company to reduce costs and save time for its customers, resulting in greater success in projects that deliver connectivity to remote parts of the world. To gain a better understanding of how StormGeo can help you plan your operations, ensure safety and save costs, contact us. Delivering highly accurate weather forecasts to any location, oil and gas field or wind farm project, globally. The better the information, the lower the uncertainty.